Why does an inactive course display on the public website? Setting a course's status to inactive means the course cannot be offered. This setting however, does not control whether the course displays on the public website. The "Publish to Website" setting determines whether a course displays on the public site. This feature allows you to show that your school offers the course even if the course is not offered in the current year or term. Go to Academics > Scheduling > Requests and Schedules> Classes > Departments & Courses. 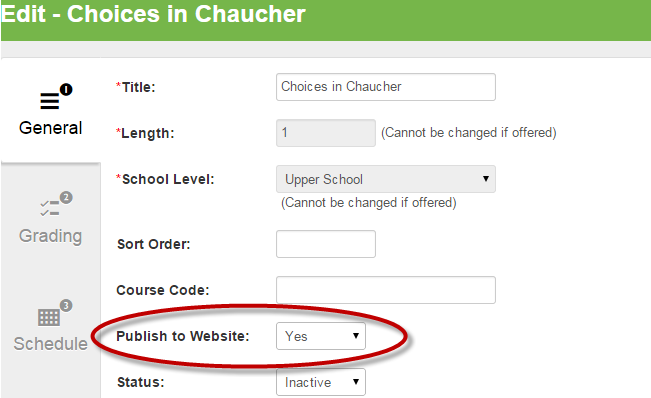 On the General tab, set "Publish to Website" to "Yes" to publish the course, or "No" to unpublish the course.